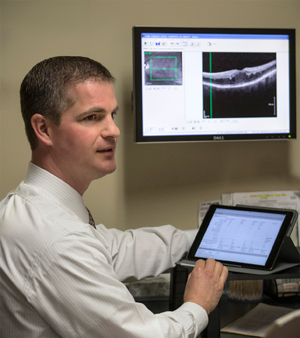 Retina Care Specialists was the first retinal ophthalmology group in the Palm Beaches and the Treasure Coast to implement a paperless office. This is a critical investment because it enables us to offer our patients better documentation and the quality care you deserve and expect. Our paperless office features computerized patient charts, which enable us to view them remotely. Having the 24/7 ability to access your medical files and images enables us to be more efficient when discussing your case from a destination outside of our office. Combined with easier-to-read documentation, the ability to send prescriptions electronically to your pharmacy, and our online patient portal, we are taking patient care to a higher level. Our current system meets all CMS Meaningful Use guidelines.